“The Triumph cycle is a British product throughout, easy to ride, smart in appearance, elegant in design, and reliable to a degree.” – Civil Service Gazette, 1906. 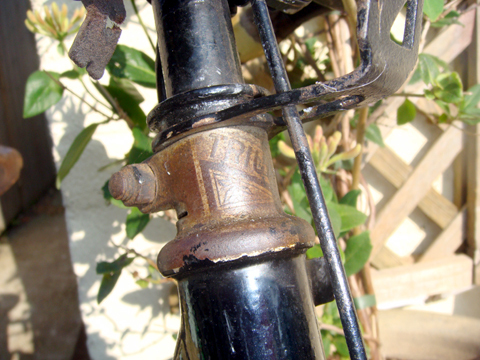 This is a charming early Ladies Loop-frame cycle in superb original condition. 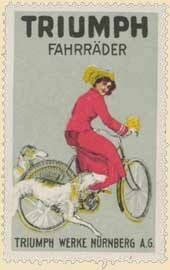 She is easy to ride, and surprisingly small for a cycle of this era. Compare the size of the Triumph with that of the 1919 Swift (which is still not as large as most ladies bikes of the era). When I got the Triumph, she still sported her original front tyre. Despite the novelty of a 99-year-old tyre, it was not really good enough to use. As I couldn’t resist taking the Triumph out for a spin, I fitted a new tyre and tube. The brakes fitted in this year are a lever slip-up front brake and inverted lever operated contracting band on the back. Though a catch-phrase generally applied to the Model H Triumph motorcycles that motivated so many of our troops during WW1, Triumph actually started using the slogan ‘Trusty Triumph’ in 1910. 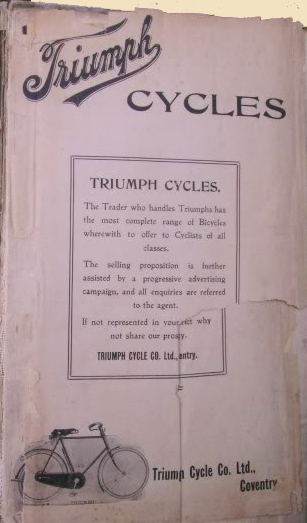 The 1906 Triumph catalogue lists this bicycle, which had few changes by 1910. Note, at the bottom of the above catalogue page, the free £1000 insurance policy given with this machine. I’m not sure that inspires confidence in riding it! I orignally thought this 1910 Ladies Triumph was a ‘Royal’ rather than an ‘Imperial.’ The difference appears to be in the design of the bottom tube. The Royal (below) is straight, while the Imperial (above, and on this bicycle) is curved. Our Imperial Lady now has a companion, and they can be found canoodling in our garden shed on moonlit nights. With all due respect, her trusty pal is four years younger. Yet his whitewall is new, while she retains her original old Dunlop. Who do you think is the boss? In 1887, Siegfried Bettmann was joined by the engineer Mauritz Johan Schulte, also from Nuremburg, and they set their minds to the production of their own bicycles, which began at their Coventry factory in 1889. It was in the late 1880’s that the internal combustion engine began to develop into a more reliable and useful power source, so Bettmann and Schulte thought about adding motor powered bicycles to their range of products. At first, they considered building the Hildebrand & Wolfmuller motorcycles under license, and imported one in 1895 for testing. They also considered building the Beeston Humber motorcycle, but both these plans came to nothing, so they decided to produce their own motorcycle. My 1935 German Triumph is very much in the style of the early Triumph motorcycles, being an uprated bicycle frame with a proprietary engine attached, in this case a 98cc Fichtel and Sachs with 2-speed hand-change gearbox. It’s not easy to appreciate its scale in these photos, but it is obviously much smaller than the much larger early Triumphs such as the ‘H’ on which it is modeled. With pedal-start and upright riding position, it feels like you’re riding a pioneer motorcycle. Fitted with the 1932 Fenton Zip Juvenile sidecar, its scale is even more confusing.